IM Puchen Wang won the 121st New Zealand Chess Congress that was held on 2nd January to 12th January at the Alexandra Function Centre, Green Lane, in Auckland. IM Puchen Wang won the Championship including the Rapid, and also the Lightning. The Major Open title was shared by Sean Martin-Buss and Paul Macdonald. The 121st National Congress has guaranteed a prize fund of over $6000 and the new champion was acknowledged with $1000. 121st New Zealand Chess Congress is a national championship that comprised of 9 round Swiss tournament and the players were a minimum of 18 years age, and was open to all New Zealand players with a current NZCF standard rating of 2000 or higher, or who have a FIDE rating of at least 2100. However there were certain rules regarding the event of fewer than 18 qualified players entering. Major Open entrants were invited, in order of rating, to bring the field up to 18. The Championship tournament is FIDE rated and overseas players were also invited by the NZCF Council. The highest placed New Zealand player in the NZ Championship automatically qualified for the New Zealand Open team for the 2014 Chess Olympiad in Norway. 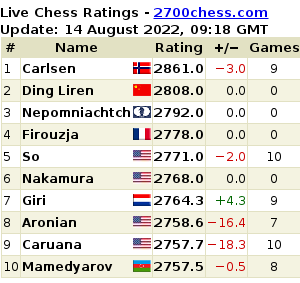 According to rules Wang automatically qualified for the New Zealand Open team for the 2014 Chess Olympiad in Norway. Wang Puchen born in 20 January 1990 is the IM-titled chess master. He became the New Zealand Champion in January 2007 when he was just 17. His chess career is quite interesting, he was New Zealand Junior Champion at the age of 11, and a winner in the 2005 and 2006 NZCF Grand Prix, wining both the Open and Junior sections.